Clean the retainer thoroughly twice a day with a toothbrush and toothpaste. Use warm but not hot water. Brushing retainers removes the plaque, and eliminates odors. 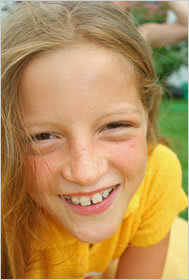 Efferdent® or other orthodontic appliance cleaners can be used but do not take the place of brushing. If you have a fixed retainer, it is cemented in your mouth and Dr. Cohen has placed it there for extra protection against tooth movement. You may not notice that the cement or retainer is loose, so if you start to see any shifting of your teeth, something is probably broken so call us immediately. You must brush and floss these retainers just as you would your teeth. Plaque and tartar will build up quickly so be sure to clean this area well.